Slimstat is a free wordpress plugin and it is the best alternative to the Jetpack plugin. The most useful feature is the access log of Slimstat. 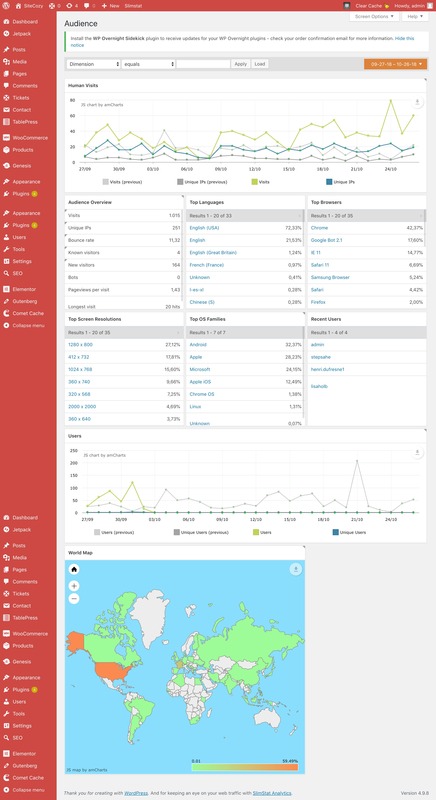 The access log also called visitor activity in Slimstat shows the visitors’ landing page, the time of the visit, the IP address, the country of origin, the outgoing link on which the visitor clicked before leaving the website, the OS, the screen size, the browser. It also helps to see when Googlebot visited the website and which page has been visited. Then, you can find the metrics that you could find in the Jetpack stats module. For example, in the site analysis category, you can find the number of user visit for the top posts. You can also find the recent outbound links, the recent pages not found, the top categories, the top authors. For sure, you can see the number of daily visits on a chart in the “audience” section. The slimstat stat plugin does not slow down the pageloads of your website back-end as Jetpack would do. Slimstat is lighter than Jetpack. I like to watch the number of daily users per post in the Jetpack stat module in the dashboard. This data is accessible from slimstat but it requires to go to the slimsat audience section and click on “today”.